Playing with my 20+ year old plasma that I got running again after a few years down time. Playing around with gouging to remove the old brackets. Pass side cleaned up. 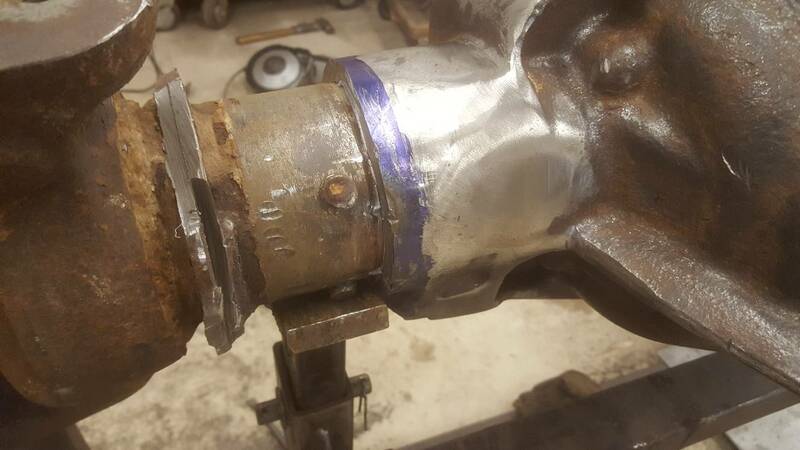 I have to check measurements, but I'm pretty sure the leftover shock mount bracket will be part of the scrap piece from narrowing the axle. 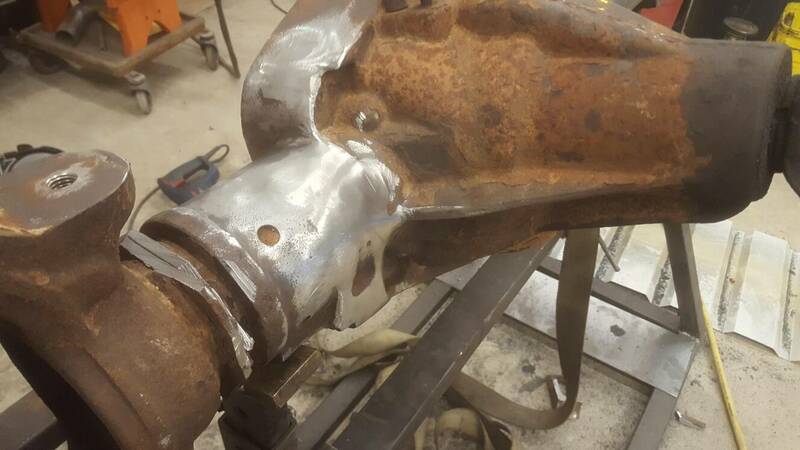 Got the radius arm off the diff, too. Lots of fun stuff going on. 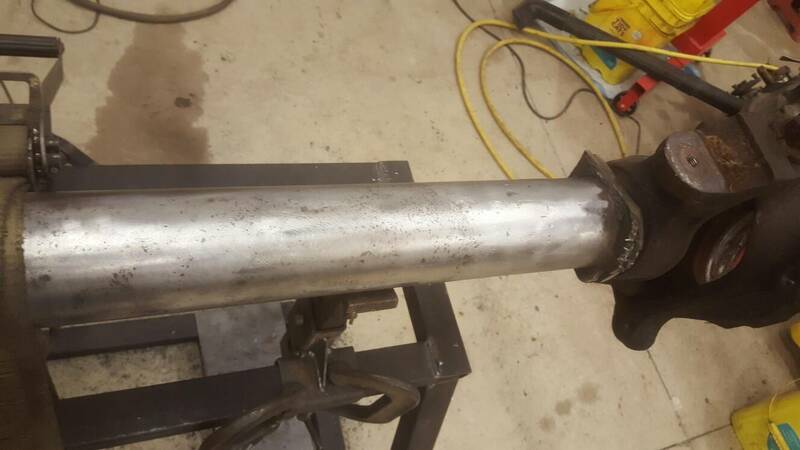 Gonna trim the left side of the housing to expose more tube? Yep, I took 2" off the casting like the artec trusses call for. Still not sure if I will buy one of their setups or go another route. In typical fashion, I started just cleaning the housing where I planned to cut, and then I decided to just after the whole housing with a wire wheel and used the needle scaler in the places I couldn't reach. I marked a line 2" around and then used the portaband to cut around the circumference. I tried to figure out how thick the housing was, and buried the blade about the same amount. Then I used cut off wheel on bottom to remove lower pieces and hide any sins from cutting too deep. I tried to prevent cutting into the housing with my cross cuts, and to make it so a piece would pop, I cut a short segment about 1/2" offset inside my final cut line. The spot was where the cut off disk had't cut all the way across. This allowed me to pop that piece out, and from there I work at it with the hammer and chisel. Last edited by JohnnyJ; April 30th, 2017 at 01:36 PM. final photo from the weekend. Pretty happy with the progress. I need to order a shaft and start measuring for narrowing. 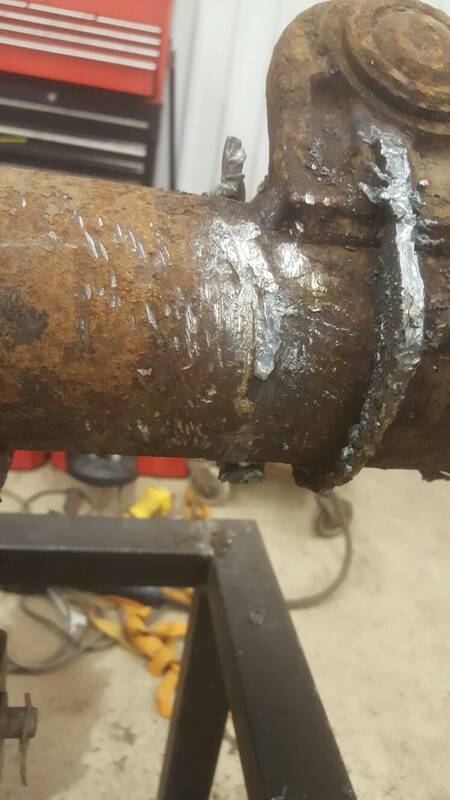 You gonna get the old one cut and resplined? Or gonna order a replacement shaft? I'm going to pick up a Yukon 4340. I'm chewing on do I go with a 78 F250 at 34.55" or K30 at 35.08". For the $200, it's not worth paying shipping there and back plus the fee to cut. 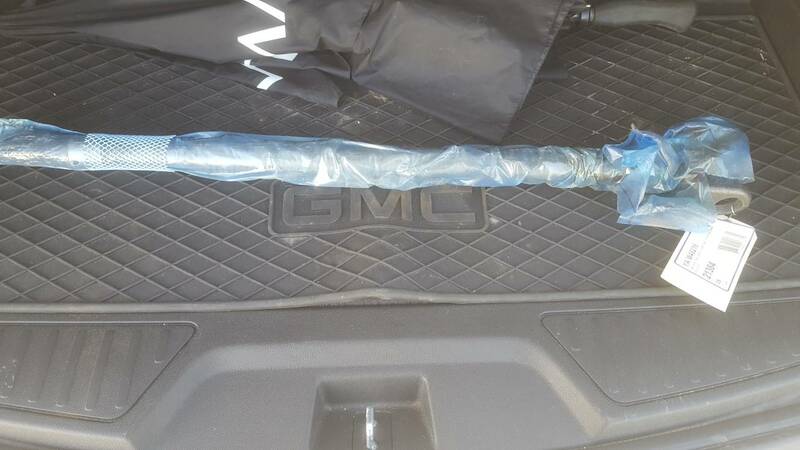 The Chevy shaft should put the WMS at 68.2", and the Ford is 67.625". The 1/2" difference isn't much, but I can stop by Bronco Graveyard at lunch since it's a 15 minute drive and pick up the Ford shaft. They won't sell non-ford stuff...I've tried. If I call and they have in stock, I'm sure instant gratification will win out. Lol. I run the chevy/Dodge shaft. Ran both the ujoint shaft and now a inner Rcv chevy/Dodge shaft. Branik was like 80-90 a shaft I think when I had one of mine cut if I recall correctly. Last edited by CheapThrillB2; May 1st, 2017 at 06:05 AM. Quick lunch-time run. Plus, there was a line of traffic coming out of your road. Plus plus, we just had lunch last week. Traffic coming out doesn't keep you from pulling in. I would think this wouldn't get lost on an automotive autonomous engineer. And you could have picked up pizza on the way. I think I missed something. 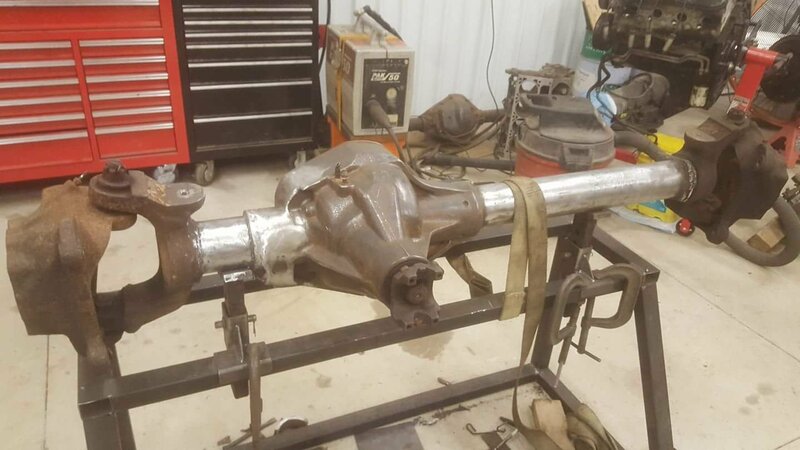 But why all the work to the ball joint 60 axle just to end up with a basically stock king pin dana 60 width? 3) I've packed/repacked enough Dana 60 bearings in my life that I'll happily pay a few bucks for unit bearings. Makes perfect sense now that I notice it is driver side drop. It looks good. I don't think the ring and pinion is any different until you get to the "fat boy" axle which is 10 lug. My understanding is that you can run Spicer 84677 and it's a 10" 5.38 gear. Granted, I don't think it makes much if any difference, but i needed to get out to #8 so i could get Cornfed to post. Lol. You can fit the bigger gears, but they didn't come to it them in the f250/350 application. Beefy's buggy has the gears I took from my 89 kingpin 60 when it got smashed and I installed them into the 06 housing with no issue. Only real difference I found, was the 05+ don't have the large oil slinger plate under the bottom pinion bearing.